This article about “Eddie Frank’s Excellent and Slightly Absurd Old School African Adventure” was originally published in 2013. Would You Buy a Used Truck from This Man? The year was 1979. “Hot Stuff” and “Message in a Bottle” were tearing up playlists on the radio. A peanut farmer from Georgia was the sitting U.S. President, videotape was still bleeding-edge tech, and flip cell phones existed purely as a sci fi fantasy. Case in point: the Star Trek Communicator. It was against this backdrop that a singular, defiant twenty-something, with wanderlust in his heart and a fire in his belly, found himself in Munich buying two large German Army surplus M.A.N. trucks, a smaller Mercedes off-road UNIMOG, and a Peugeot 404 with the outrageous plan to drive the vehicles south through Europe, ferry them at Sicily to North Africa, then traverse the Sahara, after which he’d sell them for profit in West Africa. The twenty-something, of course, was Tusker founder Eddie Frank. Barring Eddie’s predictable dust-ups with his business partner, a giant, raven-haired Yorkshireman with a fondness for drink and a disdain for fuel filters, the journey south was uneventful enough. 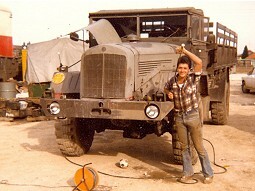 It was in Tozeur, however, in the Tunisian Sahara, where the Yorkshireman’s fuel filter aversion (i.e. he did not use one) led to a profound “knock” in his truck engine, which, when he tried to correct it, caused him to ram his camshaft through the block. In mechanic’s parlance, his engine was buggered. Eddie was not pleased. 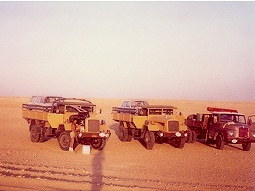 He had leveraged all his savings into these “lorries” and so, one truck down, stranded in the Sahara, he did what any sane person would do: convince the partner to tow the stricken M.A.N. 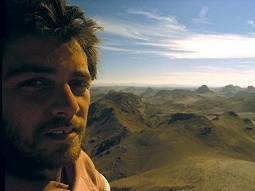 800 miles through the Sahara to n Ain Salah, Algeria, where they would leave it… for now. From there, they would drive the three healthy vehicles south (the smaller ones piggybacked on the larger), past Algeria’s Ain Amenas Gas Field, which just recently enjoyed its fifteen minutes of fame as the site of that fiery (and unsuccessful) Islamist siege. As soon as Eddie and partner reached Agadez in Niger, they tried to raise cash by selling the Peugeot. But extending his bad luck (or incompetence) the partner overheated the vehicle, burning a hole in the radiator, which he tried to fix by filling it with oatmeal (?*#! ), clogging the entire engine, and blowing it up. And on the subject of “blows,” Eddie and the partner soon came to them, with Eddie settling the score nicely on the larger Yorkshireman, Marquess of Queensbury Rules, of course. Two vehicles down, Eddie was too young and driven to even consider cutting losses. He persevered with the partner to West Africa, where they could at least sell the remaining two vehicles, the still-good M.A.N. and the Unimog. But, extending their by now absurd losing streak, they fried the Unimog’s clutch in the sand. 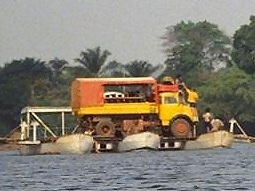 Down to one healthy truck (from four), they towed the Unimog about 400 miles to Kano, Nigeria, at which point an evermore determined Eddie boarded a flight for Munich. There, he purchased another M.A.N. and yet another Unimog, as well as a new engine for the stricken M.A.N. 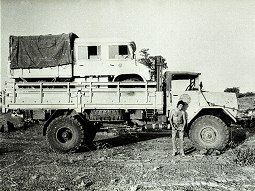 With the smaller vehicle piggybacked on the larger, his destination was Ain Salah, Algeria, where the defunct M.A.N. awaited repair, a mere 2,287 miles away. By this time, the partner had wisely decided to abandon the enterprise, lest he risk perhaps another beating, and for payment, settled on the original M.A.N. (the one he did not bugger). Based on his inverted Midas touch, it was undoubtedly a boon to Eddie, as now he was free to work alone in giving the stranded M.A.N. its necessary engine transplant. That would be easier said than done. The replacement engine Eddie had just bought in Munich was rusted solid. Owning few good options and not one to quit, he then attempted to “hone” the rusted engine block entirely. With precision power tools, it would have been a dubious proposition at best, but armed with a mere wire brush and paint scraper, it didn’t even rise to the level of a Fool’s Errand. Eddie knew he was attempting the impossible. But when did that ever deter a man who dared to dream? Eddie would scrape until every last inch of German rust was gone, or his fingers turned raw, whichever came first. One could ascribe Eddie’s accumulating string of misfortune to inadequate forward planning or the folly of youth, or both. But looking back, it can be seen as the emergence of his protean persistence – those nascent improvisational skills in resplendent though still uncertain bloom – qualities that, later, with people’s lives on the line, would serve him well at high altitude and in the bush. 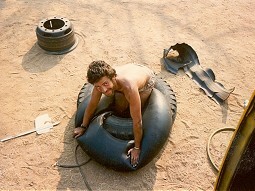 The engine “rebuild” (to put it kindly) would take Eddie two tortuous weeks under a blistering Algerian sun. Funds running low, sleeping in the truck, he lived on little more than a can of sardines a day. The diet soon took its toll. One morning, after ten days of it, he woke up with excruciating stomach cramps, his hands frozen in a bizarre B-movie monster “claw” shape. Intuition (and perhaps some Old Wives’ Tale he recalled) kicked in. Eddie had a local buy him some eggs. But the eggs were not what he was after. It was eggshells – which he would eat for the calcium. This fixed the problem, just as he would soon scrub clean the rusted motor, install it in the M.A.N., and with some local drivers, get back on the road with his replenished convoy. All he needed now was a buyer. Down to his last $20, Eddie found himself in Bangui, capital of then-named Central African Empire. After his string of misfortunes, which seemed to start the minute he reached North Africa, he was not holding out much hope. But his luck would soon change – or so it seemed. One day, an African gentleman approached him, saying that his boss was interested in the vehicles, and could Eddie come to the man’s residence to talk. Si’l vous plait. It was too good to be true. The man’s “boss,” as it turned out, was Jean Bedel Bokassa, the country’s brutal dictator, who two years prior, in the spirit of his idol, Napoleon, had capriciously declared the Republic an Empire, renamed himself S.M.I. Bokassa 1er (Sa Majeste Imperiale) and crowned himself emperor in an elaborate $20 million ceremony which consumed one-third of the nation’s annual budget, his diamond-encrusted crown alone costing $5 million, while his two-ton Parisian-designed throne was made of solid gold. His “residence,” a heavily-fortified palace on the outskirts of the city, was opulent, to say the least. Eddie had no illusions; he knew exactly who his “customer” was – overthrower of David Dakko, the Central African Republic’s first democratically elected post-Independence president – a bloody tyrant who punished unemployment with prison, outlawed drumming (except on weekends), and who perpetrated a ruthless reign of terror to protect his power, torturing and eliminating the opposition, hoisting him into the pantheon of evil African strongmen somewhere near the vicinity of Uganda’s Idi “Dada” Amin, a dubious honor, to say the least. And if this were not enough, rumors persisted that His Imperial Majesty had fed visiting French President Valery Giscard d’Estaing the cooked human flesh of some of his murder victims, stored in giant walk-in freezers. Appetizing. Bokassa was not the world’s nicest guy, but in that cynical geopolitical game called the Cold War, he was tolerated by the West because of his staunch posture against Communism. And he was tolerated by Eddie because when you’re down to your last $20, stuck in a hot, humid and repressive African “empire,” you’re not inclined to take too moral a stance on the character of your customers. Eddie did not need redemption; it was cash. Do You Have Any Jets? Emperor Bokassa strode full of pomp, in full regalia, into the ceremonial greeting chambers where Eddie was waiting. Hewing close to his Napoleonic myth, he was a diminutive man, and he asked in French the price of the vehicles. Matter of factly, Eddie replied. The Emperor strode back out of the room. Based on the rumors, Eddie was left hoping he would not be invited to dinner, or worse, become it. When you face an all-powerful man reputed to be a cannibal, one tends to pucker in the appropriate places! Ten minutes later, Bokassa returned with $70,000 in fresh bills (asking price) – and the wish to buy more surplus, including jet aircraft, marine boats, and of course more trucks. Eddie had little time to decide whether to pursue the relationship. Two months later, Bokassa would be deposed by a French-led military coup, returning elected president David Dakko to power. The world’s patience had run out. Soon after Eddie had taken the money and run, Bokassa orchestrated the massacre of over 100 elementary schoolchildren who refused to pay for and wear expensive government required uniforms – while at work in a factory owned by Bokassa. And as if personally beating several of them to death with his ebony cane was not crime enough, he was accused once again of dining on a few of them. It seems that even cynical Cold Warriors had their limits. It was said by William Shakespeare that “our beginnings know not our endings.” When Eddie left Munich with four vehicles to sell in West Africa, he could not have imagined the surreal, absurd and roundabout journey that would lead him to the palace of a cannibal despot. And while this undeniable rite of passage would provide Eddie with a great story, and the nest egg he would later use to launch his globally recognized adventure travel business, there were a few key life lessons to be gleaned as well. Firstly is the overriding importance of clean fuel filters, which leads directly to the necessity of carefully vetting one’s business partners. And as to long term career options, “rebuilding” engine blocks with a paint scraper is definitely a non-starter. But perhaps most important, when it comes to automobile coolant, oatmeal is best left on the breakfast table.